CBA Related Inquiries / Assistance | Fil-Nor GAIN, Inc.
All Filipinos seafarers working aboard Norwegian controlled vessels should be covered by a Collective Bargaining Agreement (CBA) where one or more of the three Norwegian Maritime Unions are part of. The CBAs are negotiated every second year and evaluated once a year by the Norwegian Seafarers’ Union and AMOSUP. The CBA governs your working hours, wages and sick benefits along with other regulations the company or shipowners’ association has obligated itself to in regards to a seafarer’s employment conditions. 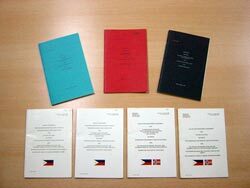 Fil-Nor GAIN, Inc. was established to assist and provide information to Filipino seafarers, who are working aboard Norwegian owned and controlled vessels covered by these Collective Bargaining Agreements with regards to their rights and benefits as an employee as stipulated in the CBA.